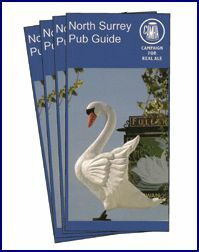 The first comprehensive guide to all North Surrey pubs in the boroughs of Elmbridge, Runnymede and Spelthorne since the all Surrey Pub Guide was published 12 years ago in 1997. The new guide contains full details of every known outlet in all 3 boroughs plus excellent editorial content, maps, photos, etc plus details of all pubs closed in the intervening 12 years. The North Surrey branch covers the administrative areas of Runnymede and Spelthorne from Stanwell in the north to Woodham in the south and currently has around 350 members.